Muslin is a fine cotton cloth, cool in the hot climate, famously produced in Dhaka and exported to other Asian countries and to Europe. Surgeon with the Army of the Indus James Atkinson wrote: "The cotton of which all the muslins are manufactured is produced in abundance all over the province, and of a finer quality than in any other part of the world. Those grounds which are annually overflowed by the Ganges, are said to produce the best kind of cotton." Before the arrival of the British this area had also been famous for its fine silks. 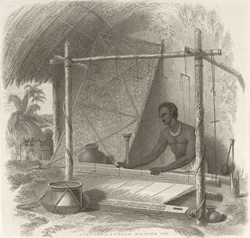 This etching was taken from plate 16 of Charles D'Oyly's "Antiquities of Dacca".